Time for more #BakingWithBetty photos!!! I loved the General Mills buildings! I think everyone that went on this trip had said at least once that they would love to work there. Every employee that we talked with felt that it really is their dream job and they are so passionate about the products. The fact that the company provides such a beautiful place to work with so many extras does not hurt! Check out this view from the Betty Crocker Kitchens! If you look past the windows you can see some of the surrounding area including their pond. They have sports that people can sign up to play during their lunch break. In the winter the pond freezes over and the employees can ice skate and play hockey. While we were there we saw a group exercising on the hill. 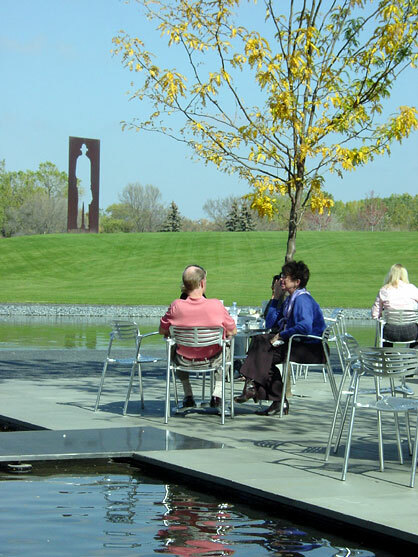 Employees also have the option of eating their lunch in an outdoor setting. How neat would it be to take a break from your work and enjoy a relaxing lunch outside by the pond!?! No wonder everyone there was so happy. This photo is not the best because 29 other women were racing to get pictures as we walked through the building. I had to get the shot though! This rock garden can be viewed from inside a walkway between the buildings. We were told that the Cheerio rock garden is best viewed after a dusting of snow. Then it looks like Frosted Cheerios in a bowl of milk. I spied these Pillsbury Doughboys hiding around corners so I had to take pictures! Don’t forget to keep checking back. There are a lot more photos from this trip plus some incredible recipes. Wow~~~ Lucky you!! Getting to go on a tour of Betty Crocker. Sorry I deleted the last comment, I put in the wrong url for the apron giveaway. Following you from Follow Me Back Tuesday. I would appreciate it if you would stop by and follow me back.